Leading Manufacturer of artificial marigold flower garland, dual color artificial decorative flower garland, artificial marigold flower garlands and artificial marigold flower strings from Delhi. Our organization is ranked amongst the reputed names in the market for providing Multicolor Color Artificial Marigold Garland. Furthermore, we present this at nominal prices. 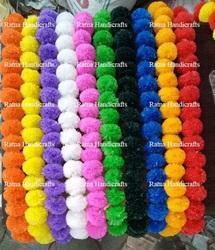 We are specialized in offering a best quality range of Dual Color Artificial Decorative Flower Garland. The strings which can be used for decoration at all times are made up of plastic and have look of the original marigold. 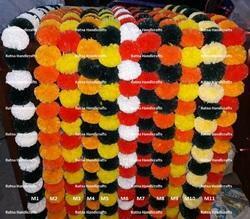 Artificial flower garland made of marigolds. These are plastic made original look Marigold flowers which give the real look. They can be used for any events like wedding, home decor, mehndi and other functions and can be easily reused. Artificial Marigold Flower Decoration Garlands woth bells for all time use. Thr strings can be used for events, home, door, lawns and other places. They have a golden bell at the bottom to add to its look.